Sift the flour in a glass bowl and add the baking powder. Crumble the soft Stork Bake in the bowl and also add the treacle sugar and mixed spice. Now roll up your sleeves and knead all the ingredients to a firm, smooth dough. Wrap the dough in cling film and let it firm up in the fridge for half an hour. In the meantime, grease the bottom of the baking tin with Stork Bake and cover the bottom and sides of the tin with baking paper. The Stork Bake will help the baking paper to stick. After half an hour, the dough is ready to roll out. Sprinkle some flour on your kitchen worktop and roll out the dough from the middle, using a rolling pin. Donât roll it out too thin, try and keep it about 0.5 cm thick. Bake the dough for 15 minutes in the pre-heated oven. Take it out of the oven and let it cool for about 1 minute. Make sure it is still hot enough, so you can cut shapes from it really easily. Let the gummy bears melt in a saucepan on a low heat and stir from time to time. If you notice the bears are still too sticky, add some water. Make sure the mixture doesnât start boiling; you need an even, sticky liquid mass. Put a teaspoonful of the mixture where the tie will be placed to be and let the tie set. Add some onto the front of the tie to give it a nice red colour. Now make the icing. Mix the icing sugar with a little bit of water. Rather start with too little water than with too much, as otherwise the icing could become too runny. Mix to a thick white sugar paste. If you want, you can also add some food colouring to it. When the figures have cooled down completely, you can finish them off by decorating them with icing. If you donât have a piping bag already, take a sheet of baking paper and fold it into a cone shape to make your own piping bag. Seal down the edges and cut off the tip. 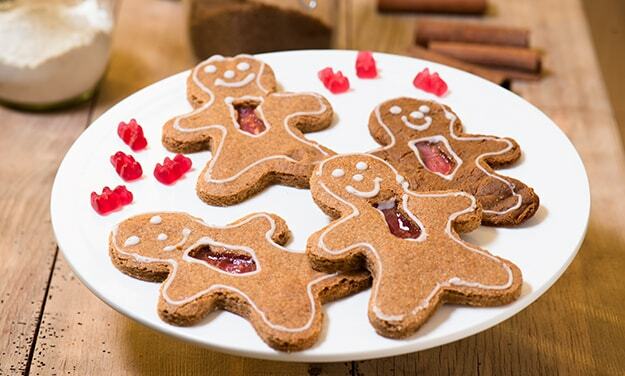 Use your piping bag to carefully decorate your gingerbread men with eyes and a mouth, or a colourful outline.